A little while ago, nesting hit me really hard. I was determined to get as many projects as I had in my head for the past few months finished. 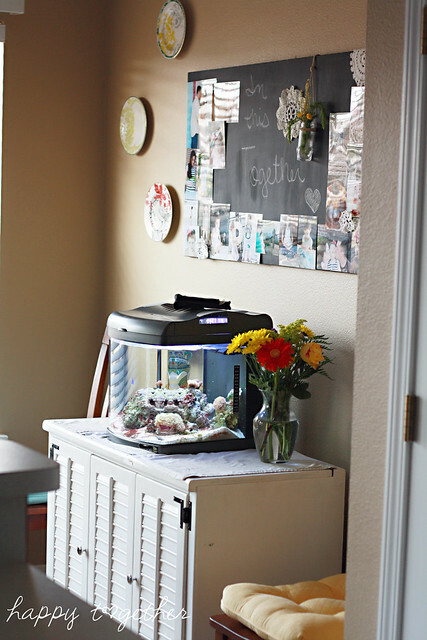 I hadn’t decided on what I wanted for baby’s nursery, so I went for other home projects. Thus the wall in our eating area is now decorated! I had this large canvas for a while. I was going to use it for something else, but I saw the picture below and knew I would use the canvas for a similar look instead. 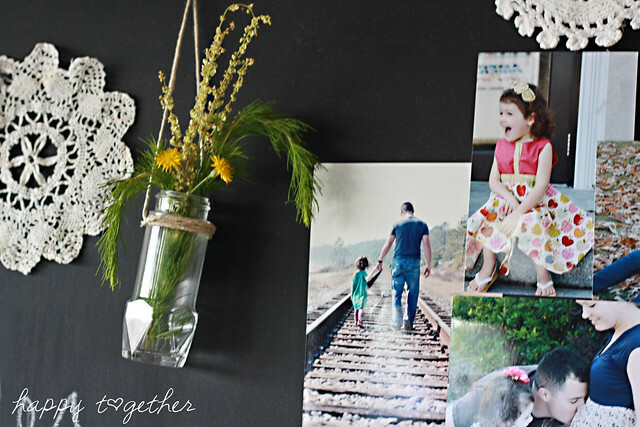 I used this wonderful chalkboard paint from DecoArt. (Thanks again Mallie 🙂 It only two two little small bottles to cover the whole thing twice like the instructions state. I had also been collecting plates from Anthropologie while we were living in Jax. They had been sitting in the closet waiting to be put up as well. I added a few vintage doilies to take up some space until I have more pictures to add once baby #2 arrives. This is a stand I had spray painted yellow a while back. The lovely measuring cups are from Anthropologie and are from a friend of mine back in Jax. 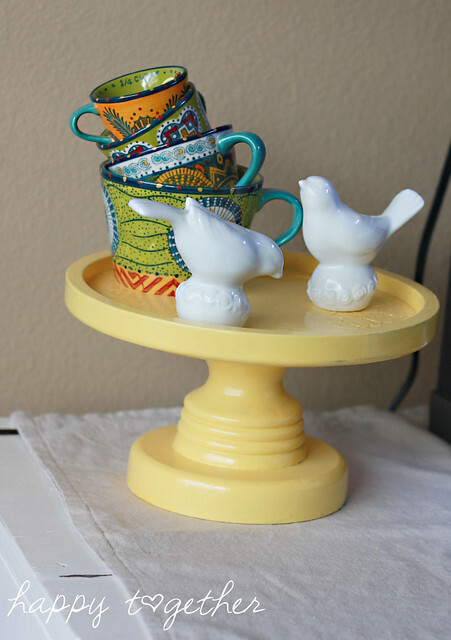 The bird salt and pepper shakers were from Target. It’s so nice to look over from our kitchen now. Much better than a plain wall for sure. 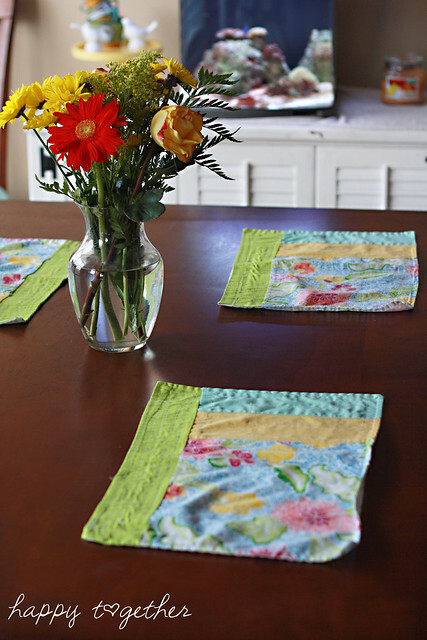 I also made these place mats last summer. I don’t think I ever blogged them. I made them from Anthropologie napkins. A quick little thing to spruce up the table. We homeschool and I’m dying to have a giant blackboard. But we have textured walls so I’m trying to come up with something. Love all these ideas. Thanks for sharing! I love those. What a great idea. I can’t wait to try it when I get my own place. What a cute idea. We have a chalkboard door on our old pantry door. Though I’ve been to busy being exhausted from pregnancy to do anything with it other than our gender reveal party. My energy comes back right because I feel like I have a better shot getting my mind back than my energy at this point! 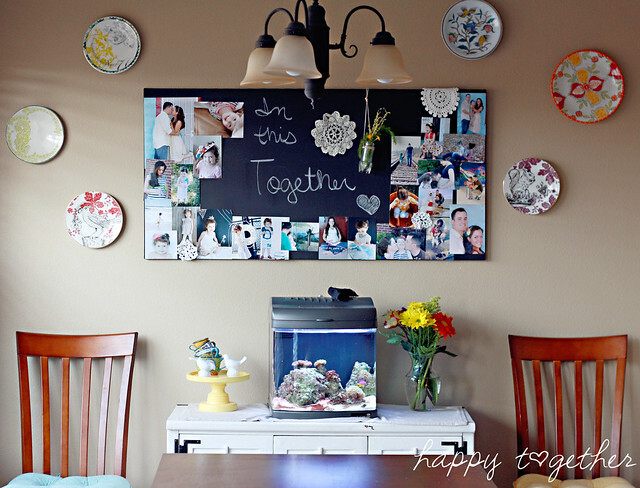 wow….love the idea….it looks beautiful…i like such picture boards….i have one in my room too. How fun!! I love chalkboards too! When I get a place of my own, I want to paint a wall with chalkboard paint! 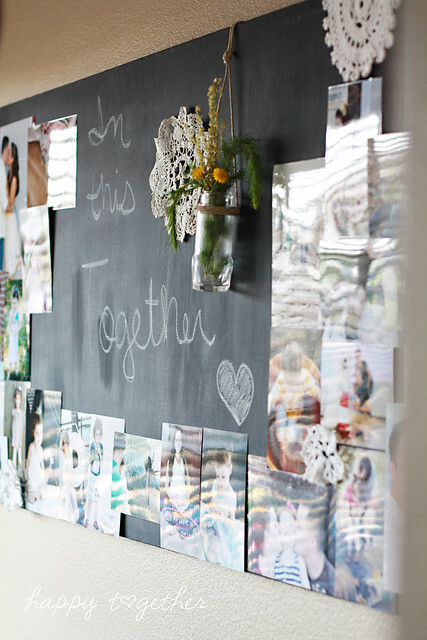 I love the idea… I am inspired to have a big chalkboard wall and have my list of 30 before 30 for everyone to see. That way everyone knows my goals and which ones I have achieved. 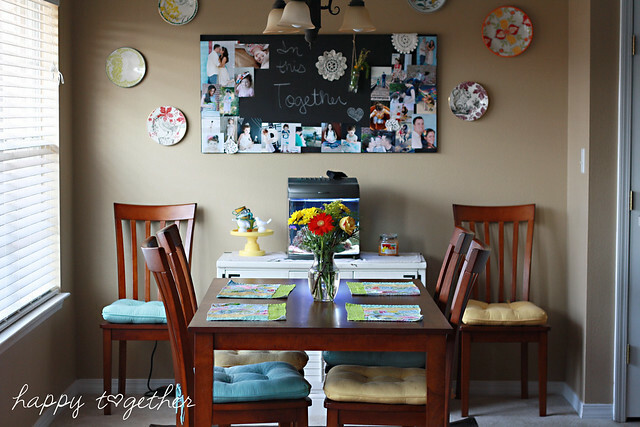 It looks very nice, all together – the board, the lamp and plates. It’s nice when you can realize your ideas right on the place! I also liked very much (from other projects) the feet and “Dwell”, looks like it leaves some space for kids to play around. Otherwise what is chalkboard is for? You are so talented!! I love what you’ve done – it looks great. That looks sooooo cute! I love chalk board stuff. I’ll to pin a pic and post something on my blog this weekend but we just redid an old school desk for my daughter and did the desk top in a chalk board finish. Its such a fun was to decorate! I really like your blog! Keep up the good work! I love your wall with the chalkboard and the plates! 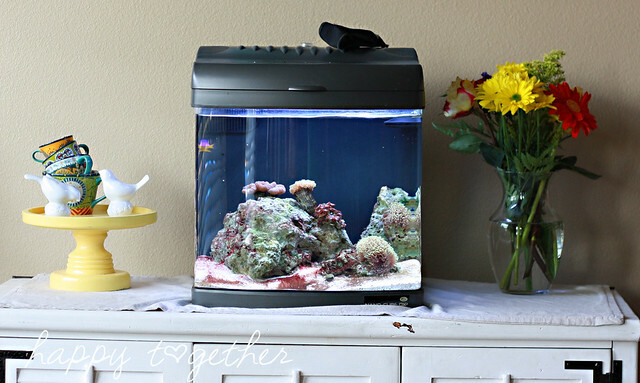 I was just wondering where you bought the fish tank, I want to get one for our place but haven’t been able to find a good starter kit for a salt water tank. I never would have thought of a chalk board as art. I really like what you did with it. All I know about this tank is that it came from Petsmart. My hubby is the one into it and all 🙂 I do know he got a great deal on it though! what did u use to pin your pics up? I just used double sided tape. 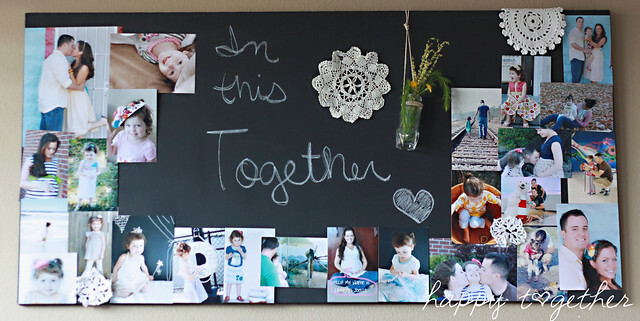 But, you could use the chalkboard paint that has the magnetic stuff in it (or I think you paint over something metal…) and then use magnets to hold them up.